Speculative Romance Author Regina Paul: Advent Calendar 2015 ie I'm giving away goodies! 404 ~ Page Not Found! Home » Advent Calendar , christmas , christmas gifts , gifts , goodies , holiday gifts , holidays » Advent Calendar 2015 ie I'm giving away goodies! Advent Calendar 2015 ie I'm giving away goodies! Just wanted to do a quick post and let everyone know I'm giving away goodies in my Advent Calendar this year! I've seen this done with 3D items for years and I suddenly had an epiphany this year. 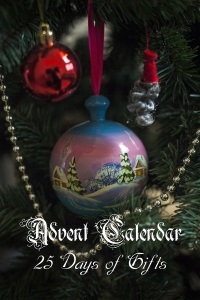 How cool would it be to be the author that did an advent calendar and gave something away every day until Christmas? So, I decided I was going to try it this year. You'll find all sorts of goodies, and I won't spoil the surprise by telling you what kinds, but I promise they are all fun! So, that being said, please feel free to pop in every day for your free gift, and also feel free to let me know which gifts you liked the most and what you'd like to see more of. If this goes well, I plan to do it again next year.